Ayman specialises in litigation procedures. He files cases and disputes with local courts and government authorities. 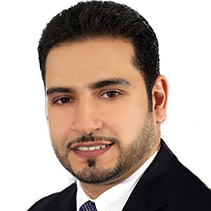 Ayman attends expert hearings and has well-rounded experience in arbitration procedures. His clients include private and government clients involved in commercial, employment, real estate, and civil law matters. He is also regularly involved in procedures associated with setting up companies. Before coming to Dubai, Ayman practised as a lawyer in Egypt for four years. Ayman completed his LLB at the University of Zagazig in Egypt. He is a member of the Egypt Bar Association and the Egyptian Chamber for International Commercial Arbitration. Ayman is licensed to appear before the Egyptian Courts of First Instance and Appeal. He is fluent in Arabic and English.